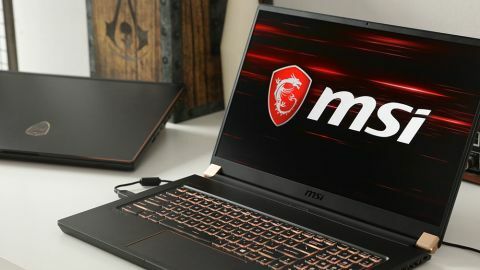 Iterating on the foundations put in place by the GS65 Stealth Thin before it, the 17-inch MSI GS75 Stealth is an almighty testament to the pervasive impact of the Max-Q design. But, due to a towering price tag and second-class build quality, it ultimately falls short of excellence. A long time ago, in the year 2017, Nvidia introduced a new technology that forever changed the the way we determine the best gaming laptop on the market. The Max-Q design philosophy was to make notebooks thinner and lighter by throttling performance ever so slightly, thereby reducing the amount of space occupied by the GPU and system fans. As a result, Max-Q graphics chips are often a little slower than their full-size desktop counterparts, a small price to pay for mobility. As we enter the third year of Team Green's push for the svelte and powerful, the path forward is evident. Although its RTX-series graphics cards didn't exactly take the world by storm when they made their debut last September, I think we can all agree real-time ray tracing has a future in PC gaming. It's just that, as of right now, buying any Turing-based GPU is bound to put a dent in your wallet. Consequently, the same goes for every laptop housing RTX graphics, including the new MSI GS75 Stealth. Whereas the 15-inch MSI GS65 Stealth Thin of yesteryear started at $1,799, this 17-inch brute I was sent for review costs a whopping $2,999. Wrapped inside its posh, black and gold-style chassis is an Intel Core i7-8750H, 32GB of RAM, a 512GB NVMe SSD and an Nvidia GeForce RTX 2080 Max-Q, all of which work together in unison to exhibit crisp visuals and smooth gameplay on a full HD, 1920x1080 144Hz display. And no, it doesn't have G-Sync support unfortunately. That said, like most gaming laptops, there are a number of less exorbitant GS75 Stealth variants to pick from. At $2,099, the base model GS75 Stealth is by no means affordable. However, it is $900 easier to digest than the configuration in my possession. In it, you'll find the same i7 processor, 16GB of RAM, a 256GB NVMe drive and RTX 2060 graphics. The display is consistent across all models. On the outside, the MSI GS75 Stealth is heavily influenced by the GS65 Stealth Thin. Gold trim complements its matte black finish. A series of perforated motifs meticulously emblazons the speaker grille. Ultrathin, half-inch bezels serve as a perimeter on each side of the display. Air vents are characterized by crosshatched lattice. Stamped on the lid is an auric rendition of MSI's trademark dragon-shield emblemage. In other aspects, the GS75 Stealth deviates from its predecessor. For instance, accommodating its lofty graphics solution and greater screen real estate, the GS75 Stealth itself is both thicker and larger than its 15-inch precursor, measuring 0.75 x 15.59 x 10.22 inches and weighing 4.96 pounds. The touchpad has expanded, too, and is now identical in shape and size to my case-less iPhone X. Port selection is unsurprisingly diverse. While traditional Ultrabooks, such as the Razer Blade Stealth 2019, often adhere to a minimalist range of connectivity, real gaming laptops—even those of the Max-Q variety—are sticking to whole arrays of full-on desktop ports. On the left side of the GS75 is a single USB 3.1 Gen 2 Type-A port, an ethernet jack, a microSD card slot and two disparate audio jacks: one designated for mic input and another for analog headphones. On the right side is an HDMI 2.0 port, two additional USB Type-A ports and a pair of USB-C ports, one of which supports the Thunderbolt 3 protocol. The other is limited to USB 3.1 Gen 1 functionality. Should you choose to forego the best gaming headset in favor of the onboard top-firing Dynaudio speakers, you won't be disappointed. Whether I was immersed in the atmospheric nuclear wasteland of Metro Exodus or vibing out to the existential melancholy of Mac Miller's Swimming, audio emission was pristine, and for the most part, unfettered. Sadly, I can't say the same for the speakers' build quality. As was the case with the GS65 Stealth Thin, the speaker grille on the GS75 Stealth is hampered by flex. Upon pressing down on its aluminum alloy surface, it flimsily sinks inward before returning back to its original position, cheapening its feel. Below the decorative albeit ho-hum speaker grille is the keyboard deck. Despite the fact that key travel is only 0.1mm deeper on the GS75 Stealth than it was on the GS65 Stealth Thin, at 1.5mm as opposed to 1.4mm, this seemingly trivial amount of added punch makes a world of difference in everyday use. For serious gamers, the SteelSeries RGB keyboard on the GS75 almost pacifies my intrinsic urge to hook it up to a USB keyboard, with mechanical key switches. Yet, compared to the Razer BlackWidow Chroma V2 I use on my home computer, the membrane keys on the GS75 Stealth feel spongy and unsuited for competitive play. As for the glass touchpad, its increased width is more of a burden than anything. Far too often in my testing, I found myself sideswiping the touchpad with my palms by mistake, as I clacked away on the keyboard located immediately above it. Worse yet, pressing down on the touchpad requires an ungodly magnitude of force. With the next iteration of GS Stealth, I implore MSI to take a cue from Apple or Razer in the touchpad department. What can I say? I've acclimated myself to Force Touch; I can't go back now. Before I get into the nitty gritty of its performance, let's take a moment to remind ourselves that the MSI GS75 Stealth I reviewed costs nearly $3,000. It's the most expensive laptop I've ever used! For that price, you could buy one and a half Samsung Galaxy Folds. And when that joke isn't funny anymore, think of it this way: you could buy a pre-built PC like the Corsair Vengeance 5180 or the HP Omen Obelisk, with better specs and for a fraction of the price. Then you could go and buy a more modest laptop for another $1,000 or so and pocket the savings. But since you're shopping around for a gaming laptop, chances are portability and performance in a single package matters to you. Though I couldn't personally squeeze it inside my oversized Herschel backpack, no matter how hard I tried, plenty of bags are custom-fitted for 17-inch laptops. Just not mine. Performance and verdict: Should I buy the MSI GS75 Stealth? Okay, side tangent over. I think it goes without saying that in synthetic benchmark tests, the MSI GS75 Stealth performed favorably. Even so, before I started, I was concerned a 1080p screen wouldn't be enough to showcase the true potential of the RTX 2080. Turns out, I was overestimating its capabilities. In Ghost Recon: Wildlands, for example, it garnered an average frame rate of 55fps at 1080p, with all the settings cranked up. Shadow of the Tomb Raider was much better, managing 87fps, while Total War: Warhammer II landed somewhere in the middle, at 73fps. It may come as a shock, but none of those games support ray tracing. That's right, Shadow of the Tomb Raider, whose support for the technology was officially announced last August, still hasn't been patched with ray tracing integration. A whole five months after its release, and six months after it was used onstage by Nvidia to demonstrate the talents of its GeForce 20-series cards, Shadow of the Tomb Raider is devoid of RTX enhancements. But I digress. Having run Metro Exodus at 52fps, with ray tracing and DLSS enabled at the "Extreme" graphical preset, I can say for certain that the GS75 Stealth handles uncanny lighting effects at a commendable pace. Battery life woes are an unfortunate commonality among gaming laptops, especially in these souped-up powerhouses wielding top-end CPUs and graphics. The MSI GS75 Stealth is no exception, as it lasted a mere 4 hours and 25 minutes on the receiving end of a Twitch broadcast, no strings (or cables) attached. If we were comparing it to other non-Max-Q notebooks that result would be par for the course. The Acer Predator 17 X we reviewed last year underwent the same testing regimen for four hours flat. On the other hand, the Max-Q-ified Gigabyte Aero 15X rode out six hours of incessant streaming. By that standard, the GS75 Stealth's battery life is actually kind of lackluster. Now, to answer the question on everyone's mind: Should I buy the MSI GS75 Stealth? Assuming you have upwards of $2,000 to spare, it is a tempting offer. Far as appearances go, it's one of the better looking machines on the market, thanks to its striking GS65 Stealth Thin resemblance. Having said that, I'm already beginning to notice some chipping away at its faux-gold paint job, and it's yet to escape my desk. From a performance standpoint, it's an impressive piece of kit, one that—while ludicrously expensive—costs less than the comparably specced Asus ROG Zephyrus S GX701 and the same amount as the 15-inch, RTX 2080-equipped Razer Blade 15 with double the storage. If two more inches of IPS panel is of paramount importance to you, the MSI GS75 Stealth is evidently the better value than the Razer Blade 15 for that reason alone. Otherwise, the overall build quality is better on the Blade. Photogenic as it may be, the GS75's prompt susceptibility to wear and tear is depressing. And even though I appreciate the increased size of the touchpad, it can be finicky in practice. Of course, my outlook isn't entirely cynical. This is a good gaming laptop. Not only is the keyboard agile yet satisfying for typing and gaming, but the port menu is stacked and performance is parallel to the beefy gaming desktops of the world. For a 17-inch lappy, it makes for quite the travel companion, too, given its diminutive footprint. But considering its steep price, I'd expect fewer shortcomings. Oh well, can't win 'em all.